This card reminds you that no one is coming to save you. You have to save yourself. You have to be your own knight in shining armour. Sure, you may have a great partner, friends and loads of people who will help you on your life path, which is a wonderful thing! But there are times in life when you need to be the one to pick yourself up, dust yourself off and start again. You're a grown up now, if you fall over and scratch your knee do you sit there and cry until mummy comes running with a Bandaid? Or do you get the hell up and get on with your day? Middle of the week - What's happening? When I pulled this card I saw these shapes as being 'organised', and that's what we need to do a little of this week. We've spent some time lately trying to see the big picture, well now it's time to zoom in on that one thing that we can do this week to move forward in our lives. You don't have to get the whole thing worked out, but you do have to make some progress. Even just some planning, some research or some thinking and journalling would be a good start. A small start is better than no start! Whatever is coming up for you in the middle of the week - break it down into manageable chunks. Don't freak out. End of the week - Freak! This weekend is all about letting your inner freak out to play! It's about being totally true to yourself, who you are, how you want to act and what you want to wear. Don't stop wearing that bright pink cardigan just because someone at work made a snarky comment about it. Don't stop singing along to the radio when you're browsing in your favourite store when someone looks at you weird, be totally completely freakishly you this weekend. 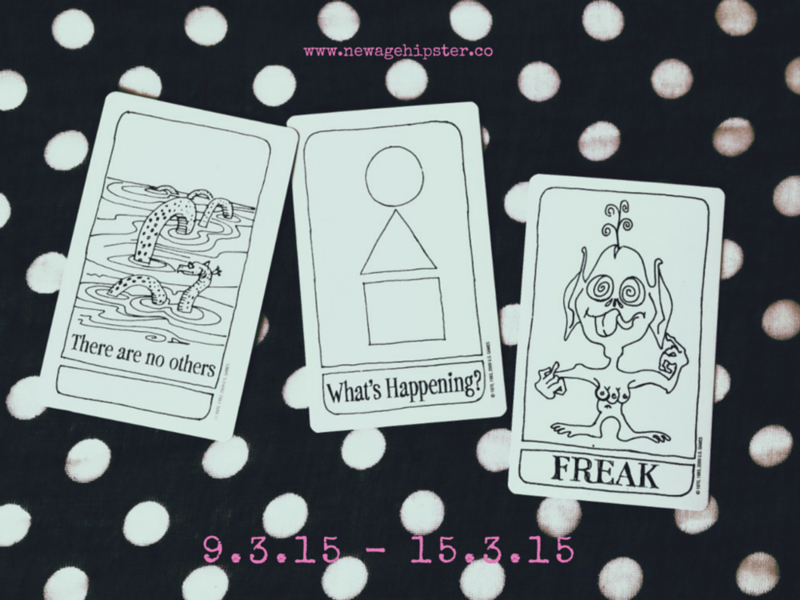 Embrace your inner freak and see what they have to tell you! On the back of that, make sure this week that you are seeing the beauty in other people's inner freaks too! When you see someone on the street who you think looks ridiculous instead of thinking "OMG what is that person wearing?" change your thought to one of "wow, that person has such an individual style", or "I have so much respect for someone that just wears whatever they want to!" I hope your week is amazing, and if you are free I would love to see you at my Angel Wisdom Wednesday event this week! I'll be doing free readings on my Facebook page for an hour! Join the event for your chance to ask a question and get a free reading! Yay! Oh, and sign up below to get the New Age Hipster newsletter because I'm about to send everyone something really cool and totally free!